Wandsworth Town has been in an in-between stage for a few years now as work progresses on making it as desirable as next-door Wandsworth Common, and thanks to new developments like The Filaments, it’s finally reaching its potential. Developed by Mount Anvil and designed by Rolfe Judd, this landmark new development consists of 340 one, two, three and four-bedroom apartments and penthouses set within five buildings: Beacon, Spectra, Copperlight, and Aurora 1 and 2. Residents enter The Filaments via Buckhold Road, where landscaped and lit walkways and gardens navigate the various buildings. The quality of this new residential complex has been recognised in the form of a Pride in the Job Award from the NHBC, from a list of more than 15,000 schemes across the UK – it was judged on criteria such a consistency in the build and undergoing spot checks. Buyers can expect to pay in the region of £840 per square foot – which is just under the average for SW18. Wandsworth Town has always been a popular corner of London for families in particular to put down roots, thanks to the abundance of green space nearby – Wandsworth and Clapham Commons to name but a few – child-friendly facilities and excellent schools, and no shortage of shops, bars, restaurants and galleries. Southside Shopping Centre has improved leaps and bounds lately with an influx of healthy eateries and high street names, whilst the charming Old York Road is home to local favourites like Konnigans and The Alma pub just across from Wandsworth Town Station. From this zone 2 station, journey times to Waterloo come in at around 15 minutes. There are also a large number of bus routes that service this area. Thanks to the £1billion regeneration that’s taking place in Wandsworth Town, there are new public squares, shopping parades and pedestrian walkways popping up all the time, and residents are also lured in by its close proximity to the river as well as its attractive neighbours like Putney, Fulham and Earlsfield with their café cultures. The Filaments does lack in the onsite amenities department, however there is a 24-hour concierge on hand for residents to take advantage of if they’re time poor. What’s more, there’s the opportunity for car owners to purchase parking spaces at £25,000. Inside the apartments you can expect a stylish, soothing aesthetic, with lots of designer touches while remaining homely and welcoming. The neutral palettes mean that residents can easily put their personal stamps on their homes. The kitchens feature charcoal high-gloss handless units with soft-close functions, white Corian worktops and Siemens integrated appliances, such as a fridge freezer, dishwasher and microwave. In the bathrooms there are double-ended baths for maximum comfort, glazed frameless shower screen, square ceramic basin with mixer tap and large format ceramic tiles on the walls. There’s dusky walnut Amtico flooring in the living areas, underfloor heating for the cooler months and two-tone pinstripe carpet in the bedrooms for comfort underfoot. There are also full-height built-in wardrobes and glass sliding doors in the bedroom for all-important storage space. Riverside Quarter and Battersea Reach are also worth considering in this area. For Canary Wharf and City workers, Tavern Quay is the ideal option for those looking for a short commuting time. 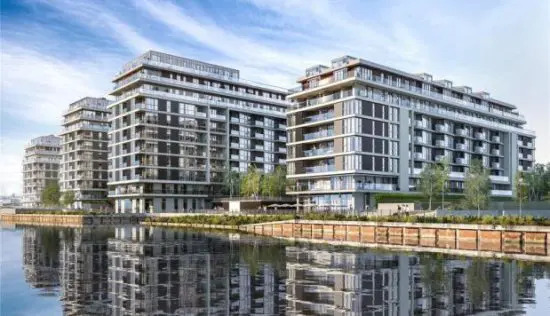 Developed by Vision, this new residential complex in Canada Water comprises 76 apartments, all featuring balconies that make the most of the riverside location, with views across the water as well as the capital’s breathtaking skyline. The location of the development is a particular draw for buyers, being perfectly situated to reach the West End quickly and easily, along with the ever-growing community of Canary Wharf to the east. What’s more, with the average price per square foot in SE16 being £1,299, the fact that Tavern Quay comes in at around £600, this will act as a further incentive for young professionals and families alike to take notice of this stylish development. The nearest Tube station to Tavern Quay is Canada Water – under a 10-minute walk away – from which you can access the Jubilee Line and Overground services across the capital. There are also plenty of nearby bus routes to transport you across town. Residents can make use of the onsite Tesco Express to pick up essential groceries, and the Plough Way Café, where you can indulge in home-cooked Italian fare seven days a week. Active folk will enjoy the proximity to the Thames, for leisure pursuits such as sailing or running and cycling along the banks. There are also numerous green spaces nearby for weekend strolls and letting the kids run off steam, before ducking into a cosy pub for a pint. In terms of shopping, you can hop on the Jubilee Line and reach Westfield Stratford City in just 17 minutes, where there’s two million square foot of retail and entertainment space. Canary Wharf, Greenwich Market, Borough Market and Spitalfields are also within easy reach. And as part of the huge regeneration of the area, Surrey Quays Shopping Centre is another retail destination that shoppers will want to add to their list. As for evening entertainment, residents can head to the West End or the O2 for a line-up of top shows and acts. When it comes to onsite facilities, Tavern Quays has a respectable offering. As well as a concierge on hand to take care of day-to-day tasks such as booking travel and receiving packages, there are also 52 underground parking spaces for car owners and cycle storage, which is handy for keeping your entrance hall clutter free. Fitness fanatics can make the most of the state-of-the-art waterside gym and exercise studios, along with free access to five Fusion gyms, and as much sailing, kayaking and windsurfing you can handle. The apartments themselves are smartly presented with elegant touches – a warm, neutral palette makes it easy for buyers to envisage their possessions displayed throughout. In the kitchens you can expect contemporary German handleless units from Nobilia with granite/laminate work surfaces, a polished chrome monobloc mixer tap and fully integrated Bosch appliances. The bathrooms feature Minoli porcelain tiles, statement baths and basins, Vado shower kit, and a bespoke vanity unit with storage, mounted basin and a Bergamo cascade tap. Flooring comes in the form of Karndean in subtle wood tones in the living areas and carpet in the bedrooms for extra comfort. Balconies include a glass/metal balustrade and fuss-free decking, which can be accessed from a sliding glass door. Other developments in the area to consider are Marine Wharf East and London Square Canada Water. The former site of the Royal Arsenal development on the border of Woolwich Town centre has quite a history. Dating back to 1671, it used to be a munitions factory – hence its name – and the combined forces of Berkeley Group along with Allies and Morrison Architects have ensured that it incorporates a blend of converted and new-build properties that blend seamlessly into the urban landscape. The complex is set within an 88-acre plot that includes 1km of river walk that will appeal to nature lovers, and is peppered with landscaped courtyards and piazzas designed by landscape architects, Gillespies. Along with its riverside address, residents can also expect the arrival of an onsite Crossrail station from 2019. These factors, combined with the sympathetic mix of renovated Grade I and II-listed buildings with brand-new apartment units and an array of luxury facilities, means that this development won’t be short of interested buyers, even at a cost of around £834 per square foot (the average for SE18 is £475). 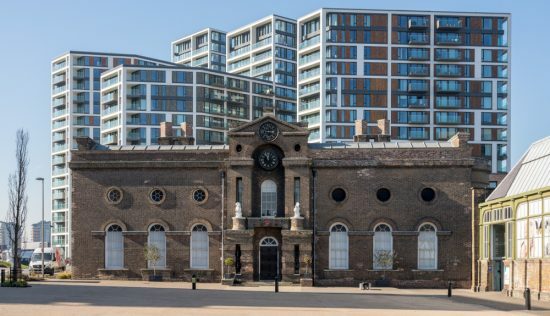 There are National Rail and DLR stations a mere 300 metres from Royal Arsenal, with commuting times at around 14 minutes to Greenwich, 19 minutes to Canary Wharf, 23 minutes to London Bridge and 29 minutes to Charing Cross. International travellers will be able to reach London City Airport in just 7 minutes. As previously mentioned, an onsite Crossrail station from 2019 will drastically cut journey times across the capital – for example, Canary Wharf will be reached in 8 minutes, Liverpool Street in 14 minutes and Heathrow Airport in 50 minutes. Of course, being situated on the river means there are alternative forms of transport – the Thames Clipper riverboat service can whisk you from Woolwich Arsenal Pier to the likes of Greenwich, Canary Wharf and London Bridge for a more scenic journey to work. Residents won’t be short of shops, restaurants and leisure facilities on their doorstep and, once Crossrail is in place, areas like Canary Wharf and the West End of London will be within easy reach, giving them even more choice of activities during evenings and weekends. Families in particular will enjoy the abundance of open space and parks, including the lawns and formal gardens of Wellington Park and the forthcoming four-acre Maribor Park, not to mention the 1km of riverside walks. Where the development really excels is in its line-up of amenities. The Waterside Club is health and well-being centre located within Pavilion Square, featuring a residents-only spa, 20-metre swimming pool, a 7R gym and cinema room. Elsewhere on site there’s a Premier Inn, Marks & Spencer, doctor’s surgery, dentists, pharmacy and nursery, as well as gastropubs and cafés for socialising with friends and fellow residents. A 24-hour concierge will take care of any daily tasks like receiving parcels, arranging general household maintenance, and booking travel or entertainment tickets. The interiors within Royal Arsenal are sleek and contemporary, if a little on the greige side – they need an injection of warmth and personality. Kitchens include composite stone worktops, a stainless steel sink with chrome Monobloc mixer tap, frameless ceramic glass hob and a matt timber effect on the cupboard units. In the bathrooms you can expect tiled flooring, a fitted vanity unit with shelf and plinth lighting and a thermostatically controlled electric towel rail. Storage can be found in the form of fitted wardrobes with mirrored sliding doors in the bedrooms. Buyers should also look at Callis Yard and Wellington Quarter in this area. 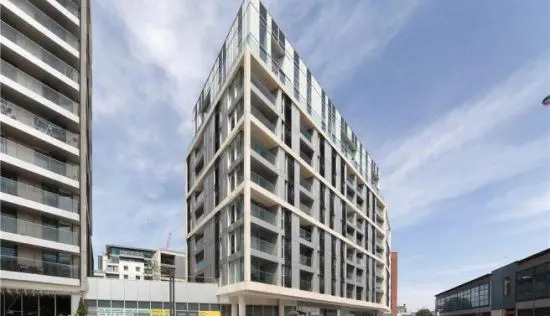 Within the lesser-known North West London village of Queen’s Park is the new development, Queen’s Park Place, developed by Londonnewcastle and Bouygues Development, and designed by the award-winning SimpsonHaugh Architects. 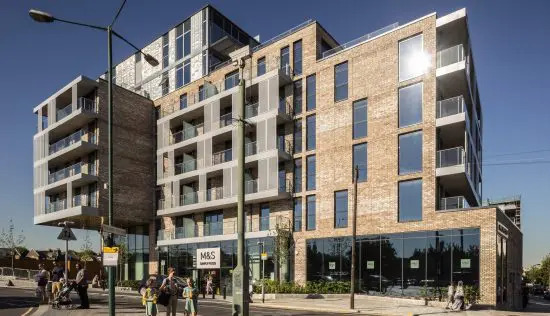 It’s home to 144 new apartments and penthouses – 28 of which are affordable – which have been given a Manhattan-esque aesthetic that will appeal to young professionals looking to put down roots in a reasonably central London location. What’s more, each of the apartments has its own large balcony and/or roof terrace, which is always a plus for families in particular. Set on a 1.7-acre site within private courtyard gardens, Queen’s Park Place forms part of the £400million regeneration project taking place across the South Kilburn area aiming to enhance the local landscape. Buyers can expect to pay in the region of £863 per square foot for a unit, which is slightly above the average for NW6 of £660. Situated right next to Queen’s Park Tube station on the Bakerloo and Overground lines, commuting into Central London and beyond couldn’t be easier. Travel times come in at around seven minutes to Paddington and the Heathrow Express, and 15 minutes to Oxford Circus – from 2019, Crossrail services mean that residents will be able to reach the City in nine minutes and Canary Wharf in 16, which will be hugely appealing to those looking to avoid lengthy journeys to work. Queen’s Park has historically been overlooked by the more popular nearby areas of Kilburn, Maida Vale and Hampstead, but has plenty of attributes of its own. The 30-acre Queen’s Park for one is a cherished part of the community, with its tennis courts, café, city farm and woodland walks to enjoy, and festivals like the annual Book Fair and Queen’s Park Day bring residents of the area together. There are also eclectic shops, pubs and restaurants, as well as a weekly farmers’ market, that give the area a bustling and welcoming feel. Salisbury Road and Lonsdale Road in particular are where you’ll find independent retailers and contemporary eateries such as Ostuni serving rustic Puglian cuisine. And just a stone’s throw away you’ll find Maida Vale, Little Venice and Regent’s Canal, for those weekend strolls along the waterside, as well as Portobello Road and Westbourne Grove for their world-renowned market and high-end boutiques. Within the apartment complex, there is a lobby with a uniformed 24-hour Concierge provided by James Andrew Residential, which covers a whole range of services, including private catering, dog walking, beauty treatments, sourcing entertainment tickets and restaurant reservations, car hire, and lots more besides. There’s also secure basement parking with 57 spaces (available through separate negotiation), cycle and motorcycle storage, electric car charging points, and a Marks & Spencer Simply Food store right underneath the housing that’s very convenient for essential groceries on the way home. The interior design reflects the diverse cultural tastes of designer, Tamzin Greenhill, and especially the influence from living and remodelling homes in New York for 10 years. There’s a sense of urban cool combined with practical technology, and every aspect has been carefully considered. The kitchens feature soft-closing floor and wall cabinets, a thin white Corian worktop, stainless steel splashback and LED lighting on the underside of wall units. There are also integrated Bosch appliances such as brushed steel oven and microwave, dishwasher and fridge freezer. In the bathrooms there is contemporary sanitaryware, large format porcelain grey wall tiles, anthracite porcelain floor tiles, recessed marble shelf over bath or shower, and a bespoke vanity unit in wood veneer with steam-free mirror and internal shelves. Floor-to-ceiling windows ensure the apartments are flooded with natural light, whilst underfloor heating ups the comfort levels in the colder months, along with wool mix carpets in the bedrooms. The rest of the living areas feature engineered timber flooring in grey-brown. Other developments in the area to consider are The Avenue, The Octave and Argo House.